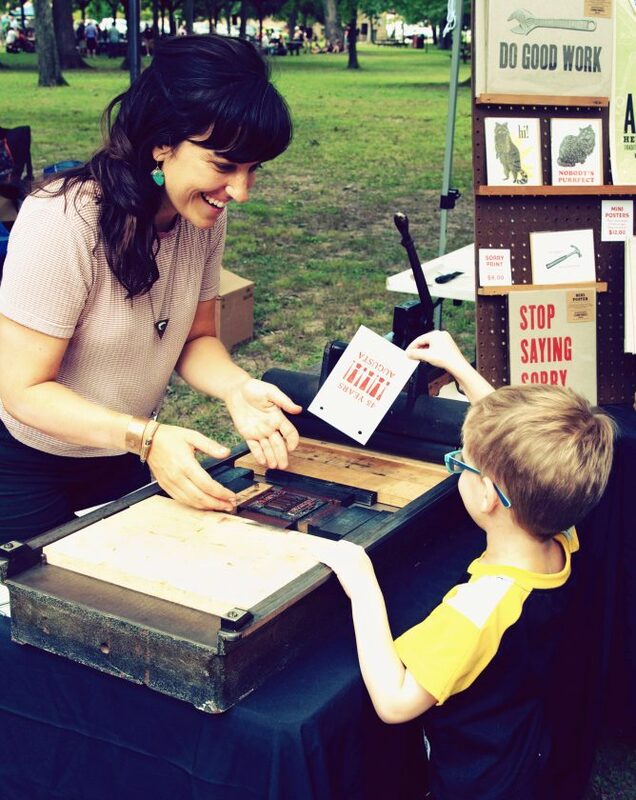 Submitted photo Sarah Brown of Questionable Press teaches a festivalgoer how to print cards using an antique letterpress at the 2018 Augusta Festival in Elkins City Park. The Augusta Heritage Center of Davis & Elkins College is accepting applications for the 2019 Augusta Festival Juried Craft Fair. The submission deadline is Feb. 15. ELKINS — The Augusta Heritage Center of Davis & Elkins College is accepting applications from artists for the jurying process for the 2019 Augusta Festival. The festival is scheduled for 10 a.m. to 5 p.m. July 27. Thousands of people from throughout the region and across the country attend the annual Augusta Festival in Elkins City Park, making it a prime location for artists to show and sell their creations. The celebration of dance, crafts and music caps off Augusta’s summer sessions of traditional arts and music classes on the Davis & Elkins College campus. Thefestival has become a tradition over the past 45 years. Augusta strives to present a wide variety of traditional art forms. Craft classifications include wood carving, basketry, glass, textiles, jewelry, soaps and botanicals, leather, pottery, paper and book arts, plus many more. Local nonprofit organizations that promote the region’s cultural and environmental heritage are invited to apply. Food vendors may also apply using the same application process. Applications for the Augusta Festival Juried Craft Fair are available at augustaheritagecenter.org/augusta-festival/vendors. The deadline for submission is Feb. 15. Applications received after Feb. 15 will be considered if space is available. For more information, call 304-637-1209 or email augusta@augustaheritagecenter.org. Programs offered by the Augusta Heritage Center of Davis & Elkins College are presented with financial support from Davis & Elkins College, the West Virginia Department of Arts, Culture, and History, and the National Endowment for the Arts, with approval from the West Virginia Commission on the Arts and the West Virginia Humanities Council, a state affiliate of the National Endowment for the Humanities. Local support is provided by the Randolph County Commission.